Remodelling a bathroom in a listed property? 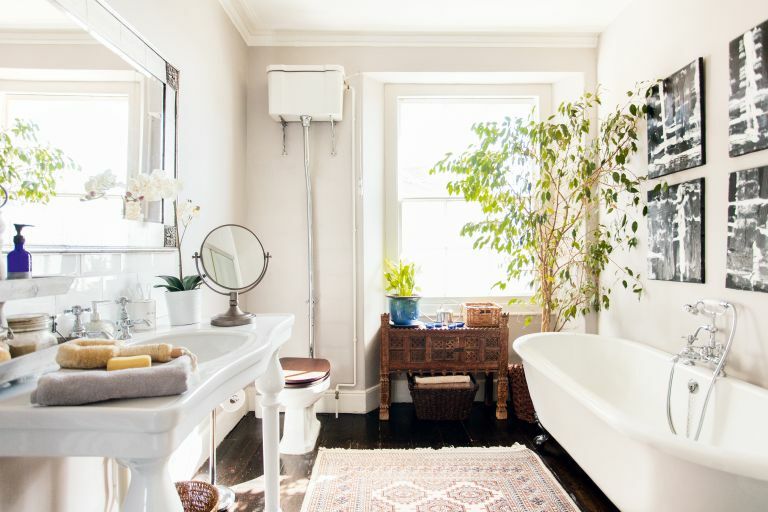 See how to do it and do it well with this real home transformation of a bathroom in a Georgian home in Bristol. Structurally, the property was in a relatively good state, so the family lived in their new home for a year, to get a feel for the space before beginning the refurbishment. There was no question about which builder they wanted for the project: Samuel Clothier, who had done a great job on the improvements to their previous house. They employed him to project-manage and carry out the building work with his team. The room contained just a bath, basin and WC, so Angela and Alex wanted to include a separate shower in the new design, as well as to give the space a period look to match the rest of the house. Sam and his team gutted the bathroom, before exposing, sanding and treating the original pine floorboards with an ebony stain. They then replaced the pink suite with period-inspired sanitaryware. For the new shower, Angela and Alex chose a quadrant enclosure, with sliding doors. It’s a modern design but it fits behind the bathroom door so it doesn’t detract from the overall traditional look. As they wanted an authentic period look, the couple decided not to tile throughout, instead using white Metro tiles inside the shower area and to form a splashback around the basin. The walls were all painted in a soft, classic beige.